Once a photographer has decided which tripod model best fits their needs (using Part I and Part II) they might choose to outfit it with a few specific accessories. These might add function to meet the challenges posed by certain shooting environments, or complement other gear that will be used with the tripod system. Either way, the Really Right Stuff Versa accessories allow for a great deal of customization and specialization for whatever you might need. All Really Right Stuff tripods come with our outstanding Versa Rubber Ball feet, which give the tripod a solid contact patch with the ground at any leg angle. The half-ball shape allows for uniform gripping of surfaces even when the contact angle may be different for each leg, and prevents the twist locks from touching the ground even at the lowest angles. The non-marking rubber material grips firmly on many surfaces, indoors and out. Versa Foot Spikes (TA-3-FS) – these long stainless steel spikes are perfect for shooting in sand, loose soil, snow, or any relatively soft or shifting terrain, and in addition to a sure, non slipping footing, give a good amount of lateral resistance to forces such as wind or water. This makes them a must-have for shooting long exposures, seascapes, and stars. Versa Rock Claws (TA-3-FRC) – these sharpened steel claws offer a hard “bite” into slick surfaces such as ice, sandstone, or algae-coated rock to prevent slipping and vibration where rubber feet just don’t cut it. 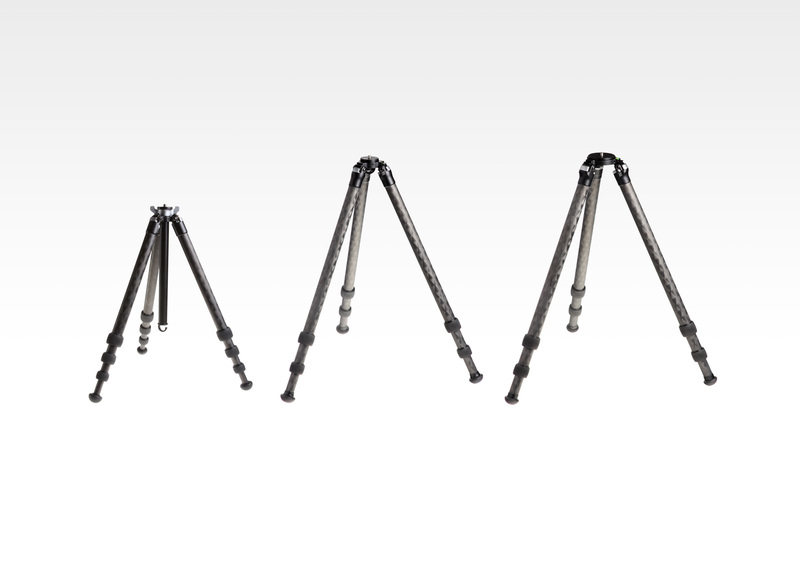 All Versa tripod feet mount via 3/8″-16 threaded studs into the end of each leg, and simply twist into place. The Spikes and Rock Claws have cross-drilled holes to allow insertion of a long hex key tool (included) that gives a better, safer grip on the foot for locking it into place. The metal tripod feet also have built-in “A.B.P.” rubber rings, which offer Accidental Back-out Prevention by increasing the friction between the foot and the tripod leg. Tripods in our Versa line are not designed with built-in center columns. This is because the most stable position for the ballhead and camera is mounted directly at the apex where the legs meet. Using a center column also takes more time during the setup of each shot. A tripod without a center column is more stable and faster to deploy in the field. Adding a center column assembly to the apex can reduce the stiffness of the mount between the platform and the apex, increasing the likelihood of vibration. Extending the column itself compounds this, inviting outside forces such as wind to further influence the camera and lens due to the loss of lateral stability. In terms of practical use it can be far more convenient to use a tripod without a column in the field, especially on non-uniform surfaces. With a ballhead directly mounted to the apex, the only requirements for extending the legs are to get the camera positioned where you need it in a balanced, sure-footed manner. The legs need not be at even angles or evenly extended at all. Conversely, since a center column needs to be level to be a truly vertical adjustment, the extension of the legs must be more carefully set, although still not necessarily even. This means more time must be spent with every setup ensuring the apex and column are level. However, there are always exceptions and trade-offs to consider. Some photographers, especially those that work primarily in the studio or indoors, may find the advantages of a Versa Quick-Column quickly outweigh any loss in stability they may face. Portrait photographers, architecture shooters, and those using artificial lighting may opt for a column as the best possible way to get the function they need: fast height changes. A Quick-Column allows for simple height adjustment in a level tripod position. As long as the tripod apex is already level (i.e. because the legs are extended evenly on a level floor), there is only one point of adjustment for a single-axis change. Versa tripods offer the use of our optional Series 2 or Series 3 Quick-Columns, which mount into the apex and give up to 14.5 inches of height extension. It’s important to note: with a Versa Quick-Column added to the tripod, the folded length of the tripod will be extended by 2.5 inches due to the height of the column locking mechanism. Only a Quick-Column tripod like the TQC-14 will be optimized for, and include, the quick-column. Versa 3 Leveling Base (TA-3-LB) – fits Versa 3 Series and Gitzo® Series 3 “Systematic” tripods. Handle hangs below the tripod apex and is used to lock/unlock the pivot action. Regular handle clears the ground at minimum height of all Versa 3 tripods. Also available as TA-3-LB-HK with a longer handle and weight hook – longer handle gives more room to operate the lock without hitting the tripod legs. Versa 2 Leveling Base (TA-2-LB) – fits all Versa 2 tripods via the Suregrip Apex Lock, and mounts atop Versa 2/3 Quick Columns. Silver butterfly knob locks and unlocks pivot action. Universal Leveling Base (TA-U-LB) – fits just about any tripod with a flat platform and industry-standard 3/8″-16 threaded stud, making it perfect for use with multiple tripods or other brands of tripod. Silver butterfly knob locks and unlocks pivot action. An additional option that’s available for those with multiple tripod heads is the ability to quick-release one head off and replace it with another. Be it for changing from general-purpose ballheads to pano setups and back, or for those who may simply need to mount a single head quickly and reliably. Just as with our normal quick-release system, this is done with two main components: a quick-release clamp on the tripod platform and a dovetail plate on the base of the head. The TH-DVTL plates (and in some cases multi-purpose rails) allow ballheads, PG-02 Pano Gimbals, and other devices to be fitted with their own Arca-Swiss dovetail to facilitate this. Quick-release clamps can be fitted to your normal tripod platform, or you can use a leveling base model that has a clamp installed, such as TA-2-LC. TH-DVTL-55 – fits BH-55, PG-02 HB, and heads with base diameter of 70mm or less. TH-DVTL-40 – fits BH-40, the Wimberley II gimbal head, and heads with base diameter of 50mm or less. Our Versa 3 tripods are large and robust enough to accommodate even the largest DSLR setups for stills, but thanks to one key accessory, they can offer that same level of support for video shooters as well. The Versa Video Bowl, TA-3-VB, replaces the standard platform with an industry-standard 75mm bowl for use with 75mm ball-base fluid video heads. This same video bowl is included with any Versa 3 leveling base, and can be removed from that assembly for use in a video application. Really Right Stuff offers five different custom-designed Tripod Quiver Bags as the perfect method for carrying your Versa tripod and head. Each size is designed to allow fitting a specific tripod size with any ballhead attached, and give both protection and straps/handles for easy packing. All of the bags feature full-length adjustable shoulder straps, mid-point carrying handles, luggage tag pocket, and 1-2 zipper pockets for holding small tools, tripod feet, or other accessories. I have been extremely happy with the Versa 3 leveling base! I wondered if I would miss a center column when I purchased a Versa 3 series tripod, but in the past month or so of use I have not. I bought the four segment TVC-34L tripod to go more than high enough so I don’t miss a center column and it is far easier to use in the field without a center column getting in the way, especially when I want to go low to the ground or in the water. I also find that on flat ground using just three leg segments is perfect for my height. I purchased the leveling base model that has a quick release clamp so I could mount my BH-40 ballhead or my Panoneed robotic head (with the larger dovetail plate installed) and swap between them easily. There is no vibration whatsoever after ditching a center column with the large robotic head. And it is extremely easy and accurate to level with the longer handle I purchased for the leveling base, far easier than when I had it on a ballhead on top of a center column on my older tripod! I’m glad I took your advice on the phone when purchasing my order (before this article was written). Glad to hear it Aaron. We’re always happy to help you guys make the right choices when buying, so having the info available here should be a help to more (at least that’s my motivation for writing it all out!). This is all very interesting, but considering how easy it is to make videos, this should be explained in video format. Trying to find out if the TA2LB will fit on eg. my Vanguard Tripod? I think it has a 3/8 inch thread. No one seems to have this adjustable head in Edmonton (Alberta) and I didn’t want to order it on line, if it won’t fit my tripod. For a tripod that isn’t one of ours, you should use our Universal Leveling bases, TA-U-LB or TA-U-LC. Those bases have 3/8″-16 sockets on the bottom, while the TA-2-LB has a base that’s designed to fit into our Versa 2 apex, not onto a platform. If you have any other questions, please email us at info@reallyrightstuff.com. Thanks! Looks like I answered one question, and that is to go for the TAULB Universal Leveling Base. However, if one wants to swap heads, can a person use the TAULC, and use of the of the plates to install a Gimble head to this base? I have a Promaster GH10 gimble head. Which plate would be correct for that head? You would probably want to use either TH-DVTL-55 or TH-DVTL-40, depending on the base diameter of the head. Please note that both of those plates have perimeter lips, so make sure you choose the one that will fit your heads base diameter with room to spare. If you have any other questions, please feel free to email us directly at info@reallyrightstuff.com. Thanks! Well guys, seems all the product links are broken. Probably you changed website’s structure. Can you please update those links? How long is the TVC-24L with only 3 sections extended? With the upper-most section collapsed it would be about 52″ tall, with the bottom-most collapsed it would be about 50″. We recommend collapsing sections from top-down, to keep the twist locks out of the water/dirt/mud the tripod might be standing in. This will keep the maintenance required to a minimum. My twist locks make a gritty sound as though the tripod was used in sand. What do you recommend to clean out the threads. It also seems the previous owner lubricated the threads.